Consistent grooming results in a clean Labrador. The short, smooth coat of the Labrador retriever leads many people to think the breed does not need to be groomed. Any Lab owner and enthusiast will tell you they do indeed shed and need frequent grooming to maintain that slick, shiny coat. Rake the dog from muzzle to tail with a grooming rake. A grooming rake has short, serrated teeth that reach into the coat and pull out dead, loose hair. Labradors are notorious for blowing coat in the spring and fall, and a grooming rake makes short work of dead hair. Brush the dog with a slicker brush to pull out stubborn hair. Slickers are wide brushes with rows of pin-like teeth that penetrate the Labrador’s thick outer coat to remove any dead hair left behind by the rake. Clean the brush frequently and toss the dead hair in a garbage bag. Lay the dog on his side, and comb him with a narrow-toothed comb. Labs have particularly dense coats and are prone to hot spots, and combing with the narrow-toothed comb lifts the coat up and allows air to circulate over the skin. Turn the dog over gently and thoroughly brush his sides, as well as the hair along his chest and under his tail. Bathe the dog in a bathtub full of very warm water. Wet his entire body, and work the water into the coat with your fingers. Rinse to remove dead hair. There’s no need to use shampoo; the water and the action of your fingers is enough to remove any remaining hair without stripping natural oils from the coat. Blow-dry the dog with a low-heat dryer. Labradors are active and may wear their nails down naturally, but older or inactive dogs usually need routine nail trimming. Ask your veterinarian to demonstrate the best method for nail trimming or seek out a professional groomer to perform this task. Don’t shave your dog. 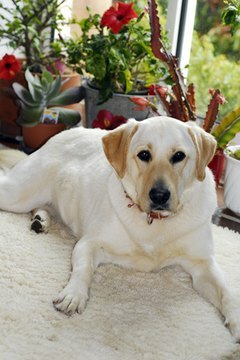 Labs have short, natural coats, and shaving interferes with natural coat growth.